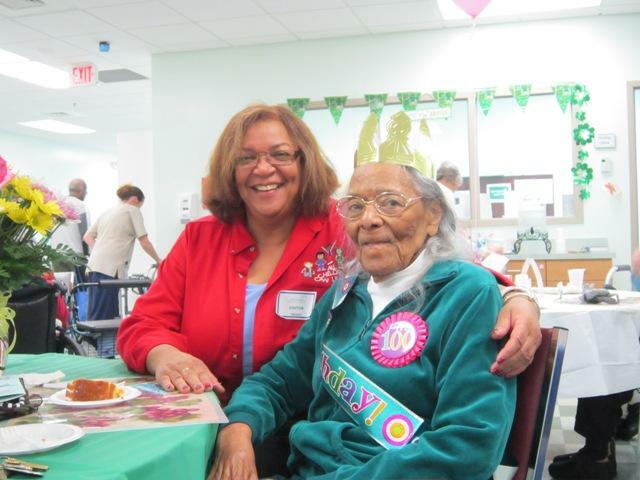 Annette Murphy embraces her mother Julia Devane while celebrating Devane's 100th birthday at the Elderhaus PACE facility in Wilmington. 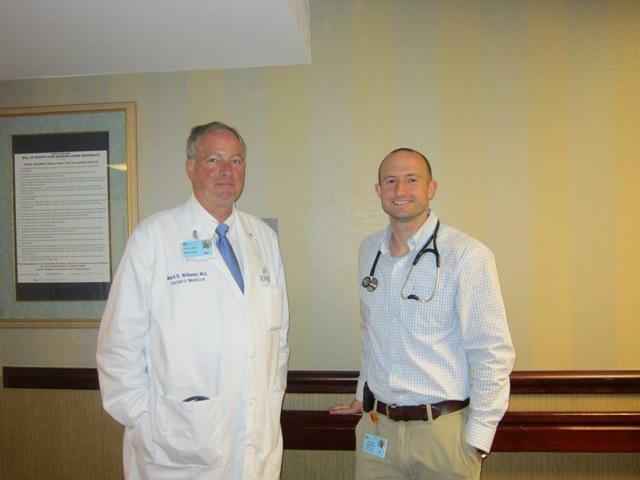 Dr. Mark Williams consults with his third-year medical resident Joshua Dobstaff while visiting geriatric patients at The Davis Community in Porters Neck. For the second part of WHQR’s series The Golden Years: Aging in Our Region, Michelle Bliss joins Williams on one of his visits to learn how senior care is evolving while the demographic grows and government funding through Medicare and Medicaid could soon shrink. Before checking in on 85-year-old Donald Medlock, Williams huddles with his third-year medical resident Joshua Dobstaff for a quick update on their patient’s recent fall. Williams is a geriatric specialist with the South East Area Health Education Center who teaches for the residency program at New Hanover Regional Medical Center. He gives lectures and presentations but prefers to teach in the field. Patients like Medlock light up when Williams greets them, shaking their hand or gently patting them on the shoulder or knee. During their visit, Williams makes sure to speak loudly and listen carefully over the hum of Medlock’s oxygen machine. North Carolina’s senior population is projected to jump from 1.2 million to more than 2 million people in the next 20 years. That means Williams is charged with teaching a new generation of doctors during an unprecedented time in human history. Having an open dialogue with patients is critical because the elderly require tailored, preventive care, which isn’t always a priority. One model of preventative care in Wilmington is Elderhaus PACE, the Program of All-inclusive Care for the Elderly, where Julia Devane recently celebrated her 100th birthday. PACE offers healthcare and adult day care to seniors like Devane who are at risk of being institutionalized and are eligible for Medicare, Medicaid, or both. Devane still gets to live at home with her daughter Annette Murphy. Together, they describe her secret to a long, healthy life. The center’s medical director Dr. Marsha Fretwell agrees with that advice, citing a key hallmark of the program: personal responsibility. If a patient feels entitled to a major crutch, like a wheelchair, their muscles grow weak prematurely. When they can no longer stand up or go to the bathroom on their own, Fretwell says they’ve paved their way to a nursing home. That’s why her patients exercise at least 30 minutes a day. Wilmington’s PACE program led the state when it opened four years ago. In two more years, there will be 11 centers across North Carolina. They each receive a fee per patient per month from Medicare and Medicaid. Having set funding, instead of being reimbursed for each prescription or procedure, is daunting. But it can spark problem-solving. In the next few months, the center is expanding to double its capacity and serve 160 patients. At the same time, other PACE organizations across the country have seen their Medicaid payments drop. If that happens in North Carolina, Fretwell and her team will continue fine-tuning their creative approach, which has already helped so many of their patients walk, live at home, and celebrate another birthday.